A government informant whom the prosecution opted not to call this time, Frank DiGiacomo, 49, took the stand today as the final defense witness in the eight-week old trial that is expected to go to the jury on Monday. Last year, much to the prosecution's chagrin, DiGiacomo discredited Monacello and undermined much of his testimony. 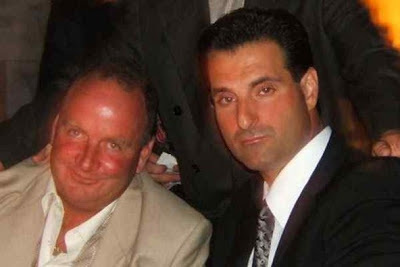 This time, while still labeling his former mob associate as a "greedy," sneaky and dangerous individual, he emphasized that both he and Monacello worked for and reported to Borgesi and Ligambi. "I never called him boss," DiGiacomo said of his relationship with Monacello, a statement that was contradictory his testimony in the first trial. "That was my boss, right there," he added, pointing to the 74-year-old Ligambi seated at the defense table. He also testified that Monacello told him that the profits from a loansharking operation they were running for Borgesi would be split among the three of them, each receiving 10 percent. And he said that Monacello told him that he, Monacello, "was handling" a lucrative sports betting and loansharking business "for Georgie" and that "all orders came from Joe." The decision to call DiGiacomo as a witness may backfire on the defense since his testimony in many ways supported the testimony of Monacello and Anthony Aponick, two other Borgesi associates who testified that Borgesi was running a gambling and loanshark business from behind bars. Borgesi, 50, was convicted in an unrelated racketeering case and sentenced to 14 years in prisoin in 2001. DiGiacomo, 49, began cooperating with the FBI and the Pennsylvania State Police in 2007. He wore a body wire and recorded dozens of conversations that were used in large part to convict Monacello, 46, on state charges for which he was sentenced to less than two years. DiGiacomo said he was Monacello's associate and muscle from 1998 until Monacello's arrest in the state case in 2008. He described Monacello as a blowhard who often dropped Borgesi's name, but his testimony lacked the bite that it had in the first trial where he described Monacello as someone who had bragged that "This is my crew and I'm the boss." In that first trial, DiGiacomo also testified that Monacello relentlessly squeezed him for money and also contradicted other parts of Monacello's testimony. Borgesi's lawyer, Christopher Warren, who called DiGiacomo as a witness, challenged him several times today on the seeming contradictions between what he was saying on the stand and what he had said last year. Today DiGiacomo said that Monacello went to visit Borgesi in prison about twice year. That's consistent with prison records and Monacello's testimony. Last year he said Monacello told him he visited Borgesi every other month, or about six times a year. In the first trial, DiGiacomo said he knew very little about money that Monacello was funneling to Borgesi through Borgesi's wife. This time he said he was required to kick in $200-a-month and that cash was given to Alyson Borgesi on a monthly basis. "Lou collected it," said DiGiacomo who told the jury this morning that he believed another friend, Sal Zangari, delivered the money. He said he knew nothing of Monacello's claim that he, Monacello, dropped an envelope of cash in the glove compartment of Alyson Borgesi's car, but insisted that cash was given to her as Borgesi's share in their illegal activities. Dressed in a brown suit, white shirt and bronze tie, DiGiacomo spent less than an hour on the stand. He said he has been relocated and is a candidate for the Witness Protection Program. He was questioned by Warren, but Ligambi's lawyer, Edwin Jacobs Jr., opted not to ask any questions. In the first trial, DiGiacomo described the mobsters he associated with as "good guys" who were fun to hang out with and he described himself as someone who had "betrayed" his friends by becoming a government informant. His story today was more matter-of-fact and lacked the poignancy and personal deprecation. He said he became a cooperator because he was deeply in debt to several mobsters and couldn't repay the money. Asked by Assistant U.S. Attorney John Han if he feared for his life, DiGiacomo responded, "Yes...There was no more options, no more choices." That response goes to one of the key issues in the prosecution case -- the position that the mob's reputation for violence, even when not violence was committed, was a prime factor in controlling the criminal underworld. On several occasions he also testified that Ligambi was the boss and that he, DiGiacomo, worked in a crew being run by Monacello but controlled by Borgesi. Those comments also go to the heart of the racketeering conspiracy charge that both Ligambi and Borgesi face. They were never as clearly stated by DiGiacomo in the first trial. Judge Eduardo Robreno has scheduled closing arguments in the case for Monday morning. They are expected to take about a day and a half. Robreno hopes to charge the jury on the law Tuesday afternoon. It was unclear if deliberations would begin then on Wednesday morning. Borgesi was acquitted of 13 of the 14 counts he faced in the first trial. In this trial, the government case appears to hinge entirely on whether the anonymously chosen jury panel believes the testimony of Monacello and Aponick. While DiGiacomo, as a government witness, went a long way toward discrediting Monacello in that first trial (Aponick was not called as a witness), his testimony today fell far short of that. Ironically, as a government witness last year, DiGiacomo may have aided the defense. This time, as a defense witness, he may have help prop up the prosecution's case. But until the jury comes back with its verdict, that is merely courtroom speculation. DiGiacomo conceded under questioning from Warren that pressure from Monacello, to whom he also owed money, was a factor in his decision to cooperate. "The greed got out of control," he said of Monacello. Then, pointing to the prosecution table, he added, "That's why I'm with these guys today."